A few years back I bought a three pack of remote controllable nexa outlets. A while ago I discovered that another company manufactured a control unit that's plugged in to a USB port and best of all they provided linux software for it. It might be possible to configure the outlets completely via the software at least for some brands but I haven't tried it so I can't be sure. To make use of the Tellstick Duo control unit Tellstick provides software and easy to follow instructions. Important thing here is to install both applications telldus-core and tellduscenter. The telldus-core is the software that does the actual controlling and tellduscenter provides a GUI that I found necessary to configure the outlets for telldus-core. To pair the outlets with tellstick software I used the tellduscenter's outlet scanning option. With this option my outlets respond to the remote and the tellstick duo controller unit. With this setup I can control the outlets from a computer but only from the computer that has the tellstick duo connected to it. I want to be able to control the outlets from anywhere in my house. To control the outlets from any device in my home network I needed a way to share the control unit to my home network. 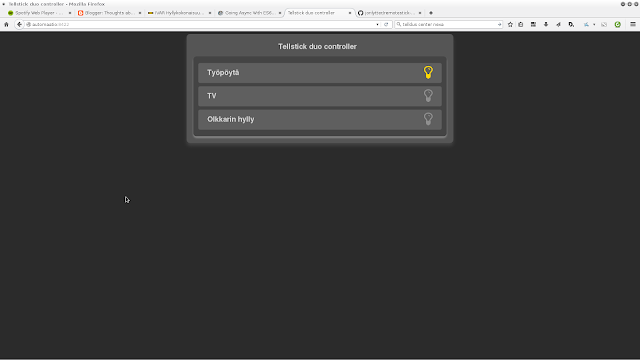 After the first idea I figured that someone must have already solved this problem in some way and I started to look for solutions that others had created and then I came across with remotestick-server that did exactly what I wanted with the exception that it produced XML. I created a fork of the remotestick-server and modified the code a bit. I removed some options that I didn't need and modified the software so that it produced JSON instead of XML. Now I have a partly DIY home automation for outlets with a simple UI to use from any device in my home network. Next step is to add more outlets and maybe some scheduled automation.